We manage to wake up at 7:00 and, although not perfect, India is feeling much better. After breakfast in the room we leave for Islands of Adventure, arriving at 8:30. The multi-storey car parks are very impressive and we take the precaution of noting down our space, Jurassic Park 304. It must be very easy to lose your car here. We exchange our vouchers for tickets where we realise that we are definitely not in WDW anymore as the women behind the counter has all the enthusiasm of a dead slug. The park opens early and in we go. The Port of Entry is lovely, very pretty with plenty of flowing water. They have certainly learned from Disney. We head straight for Super Hero Island and Spiderman. Tam and I ride first. Wow, absolutely sensational! I can see why so many have called this the ride of the future. Everything about it is right and the impression of depth from the 3D is stunning. I know that India would like this but we will let her settle down a little today before doing anything too rough. Tam goes back on with Grandma and they both come off smiling. We walk through Toon Lagoon to Jurassic Park. It does remind you of the film as you walk through the gates. Again Tam and I go on the Jurassic Park River Adventure to try it out. We are not entirely impressed by this. It is OK, but is spoiled for me by the fact that, as the gates open and you supposedly float into Jurassic Park, you see the huge white ride building looming in front of you. This definitely detracts from the immersive quality of the ride. Also the T.Rex that is supposed to frighten you at the end is visible well before you get to it and so wouldn't frighten a small child with a dinosaur phobia. The actual drop is less intense than Splash Mountain. The animatronic dinosaurs are good but they seem to be few and far between. We have to find something for the girls to do next so we head into Camp Jurassic for the Pteranodon Flyers. You can only ride this with a child, so Georgia and I go with Grandma and India. I really like this. You get great views of the park, even though it is very short. Georgia wants to go again, so she goes with Tammy. I am sniggering to myself because Tam is not too keen on heights and I know she won't like it. Sure enough she comes off saying never again. (Stifles laughter with back of hand). We then let the girls have a run around in the play area for a while. The girls opinion: better than the Boneyard. Back to Toon Lagoon and we all go on Popeye's Bilge Rat Barges. I get drenched, the rest get merely soaked. This is much better than Kali River Rapids. Why did Disney not make Kali as long and rough as this? The only problem is spending the day trying to get dry. It's a good job it's warm and sunny again. The girls and Grandma then go to play on Me Ship, The Olive. I think one problem with this park is that the two big roller coasters dominate. You can see and, even worse, hear them from practically anywhere in the park. This detracts from whichever area you are in. By the way, there is no way I am riding either coaster. All I would succeed in doing is making myself sick, so there is not much point. Rock 'n Roller Coaster is about my limit, I think. We backtrack to the Pandemonium Cartoon Circus Show. None of us can believe how incredibly bad this is. I realise it is supposed to be for children but even they are embarrassed by this. They ought to get a clue by the number of people that walk out half way through. Remove it quickly please. India and I go off to do Dudley Do-Rights Ripsaw Falls but just as we get to the front of the queue the ride goes down. What actually happens is that the ride is being loaded and just as the log starts to move off somebody decides to jump in the front. One of the ride attendants hits some sort of emergency stop and they have to reset the whole thing. Walking back through Jurassic Park we go to the Triceratops Encounter and India gets to stroke a real live dinosaur. Honest! This is very clever and believable. The Discovery Centre is pleasant enough but nothing really stunning. On to the Lost Continent. By general consent this is the most spectacularly themed of all the islands. Just the right blend of ancient sorcery and eastern mysticism. Even the shops are varied and interesting. We stand in front of Duelling Dragons (or as India thinks it is called Drooling Dragons) and watch the fools going to their certain doom. Are these people daft? Next is the 8th Voyage of Sinbad. This is a theatre show and the stage is stunning based around a huge cave filled with wrecked ships. The show itself is very good but does contain some loud bangs. Georgia's earplugs are doing a sterling job and she watches it all. We wander around the shops and come across the wishing well. This is a pleasant surprise which I will not spoil for you but we watch the interaction for a few minutes. Poseidon's Fury is set inside a visually amazing building. A half destroyed ancient temple with the remains of a giant statue of Poseidon lying around. The show itself never quite seems to lead anywhere. The vortex is impressive but in the main show you are sort of waiting for a big finale that never really happens. We like the look of the Mythos Restaurant and decide to have a late lunch there. If you are looking for something more than burger and fries then give this place a try. Tammy has chicken in a balsamic vinegar sauce and I have herb crusted swordfish on a bed of polenta. Both are excellent, not too filling, just very good quality. Dessert is orange pecan bread pudding and ameretto creme brulee. Again both are good. Total for the 5 of us including 2 children's meals, 3 beers and a coffee is $75. Good value when you consider the ambience, service and high standard. Seuss Landing has the girls going on the Caro-Seuss-El and then 1 fish 2 fish. Here we once again witness a family with children too numerous to count clambering over everything in sight. Three of their brood ride twice in a row by hiding on the opposite side of the ride from the attendant and then jumping into one of the fish. Their parents are watching and smiling. They try it a third time but get caught. Instead of leaving by the exit they clamber over the railings and trample all over the plants in the process, while mum and dad look proudly on. If the parents allow them to do this then what chance do the children have? The Cat In The Hat ride is good fun and Georgia enjoys it greatly. The girls then run around in the play area for a while. This is a beautifully designed place with lots for little ones to do and lots of devious ways to get them wet. It is now 5:00 and, with the exception of the couple of big roller coasters, we have done nearly everything. Islands of Adventure actually looks much bigger than it is and can easily be done in a day if the crowds are as low as today. Is it better than WDW? No. Is it worse than WDW? No. It is a different park with a different feel and many different things to do. Spiderman, to me, is a ride that pushes back the boundaries of what is possible and something that I'm sure Disney will take notice of. Some of the scenery is spectacular and stunning but being able to see one totally unrelated area from another is a little off putting. 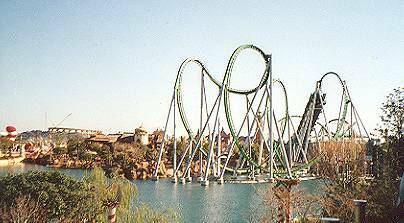 Should you visit Islands of Adventure when you are in Orlando? In my opinion, yes. However, I also agree with those that say that it is more thrill oriented than WDW. You tend to notice this more if you visit with children, a large part of their day is spent waiting for you to ride. Seuss Landing is the only true kiddie area, even Toon Lagoon has more adult rides. Having said all that, the children's play areas are excellent and India and Georgia still had a lot of fun. We walk back towards the Port of Entry but then decide to ride Spiderman again. This time India rides with Tam. She enjoys it enormously. Tam now thinks that this is the best ride in any theme park, due in no small part to it's originality. It is now 6:00 and the park is closing, it is also starting to get dark. We now do something that often happens when we tour the parks. Instead of leaving we decide to walk around the park to look at it at night. The Lost Continent is lovely in the growing gloom and Jurassic Park is more foreboding. This is as far as we get before an Islands of Adventure employee turns us back. We finally head for the exit and walk through the Port of Entry (Exit?). This is very prettily lit and we go into a couple of shops which are unusual and fun. Georgia thinks we should go to Epcot to watch Tapestry of Nations but, knowing the long day we have had, I don't think this is a good idea. Back to Dixie Landings for a snack in the food court, showers and bed by 10:00.